Finding the right drafting tools can be a difficult task. Different applications require different tools and features, and not all stores have the variety that many professionals need. The main professions that use these tools include architects and engineers, but artists also use them in varying applications to produce accurate lines. 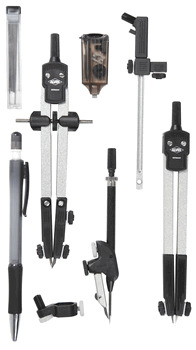 When selecting drafting tools, it is important to assign quality a high priority. Unreliable measurements and inaccurate compasses render a professional draft useless. Architects and engineers need their work to be precise to properly communicate a plan or an idea. The most popular brand names for these tools are Alvin, Fairgate, Alumicolor, and Acu-Arc. These brands are highly regarded for their precision and durability. Accumulating all of these tools can be a career-long pursuit. Like a mechanic who buys tools as he needs them or as they become updated, a professional who draws drafts daily acquires a number of tools over time. However, for those student and beginner architects and engineers, there are a few tools that are important to start out with. No engineer could produce drafts without his or her drafting scales. Rulers are an imperative part of any successful professional drawing. Protractors are also key to producing an accurate arc. Over time, you might find digital plan measuring tools to be worth the investment. It is tempting to purchase cheap tools when starting out, but these simplest of tools will need to be the most durable and reliable. They will be used every day throughout the course of your career. Nothing lasts forever, but investing in good tools at the beginning will keep you going strong into a successful career. Proper tools for drafting are essential to successful drafting. The right tools will get an architect's idea sold and an engineer's plan executed. Choosing a tool can be difficult when struggling with money, but they should be thought of as a means to an end: spend money on a good tool now, make a lot of money as a result of your accurate drafting later.